On July 5, President Donald Trump appointed Environmental Protection Agency Deputy Administrator Andrew Wheeler as the acting administrator of the EPA (EPA) following the resignation of Scott Pruitt. Wheeler was confirmed by the U.S. Senate as deputy administrator on April 12. He began his career during the George H. W. Bush administration as a special assistant in EPA’s Pollution Prevention and Toxics office. He was a principal and the team leader of the Energy and Environment Practice Group at FaegreBD Consulting, as well as counsel at Faegre Baker Daniels law firm, where he practiced since 2009. He also served as the co-chair of the Energy and Natural Resources Industry team. Prior to his work with the firm, Wheeler served for six years as the majority staff director and chief counsel as well as the minority staff director of the Senate Committee on Environment and Public Works. Before his time at the committee, Wheeler served in a similar capacity for six years for the Subcommittee on Clean Air, Climate Change, Wetlands and Nuclear Safety. 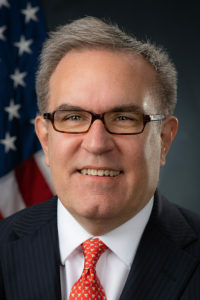 “I look forward to working hard alongside EPA employees to continue our collective goal of protecting public health and the environment on behalf of the American people,” Wheeler said. Pruitt resigned following months of scrutiny over potential ethical and legal violations. Some of these concerns are being looked into by the EPA’s Office of Inspector General. It started an investigation into Pruitt’s travel expenses in August 2017 after congressional requests and a hotline complaint were received regarding his frequent visits to his home state, Oklahoma. The review initially focused on Oklahoma trips and was then expanded to include all of his travel. Their goal is to determine the frequency, cost and extent of his travel, and whether EPA travel policies and procedures were followed.